Last week, Elon Musk had a candid conversation with VC George Zachary at the Charles River Ventures CEO Summit. One of the most interesting things Musk talked about was his desire to see electric airplanes in the future—and perhaps even one day help develop these green, energy efficient planes himself. It makes sense—Musk has an interest in aeronautics (he founded Space Exploration Technologies, SpaceX, in 2002, which develops and manufactures space launch vehicles), energy efficiency and sustainability. Electric planes combine these three in a nice package. Musk also mentioned his electric plane idea in an interview at the Churchill Club earlier this year (see video below), where he says he’s very interested in developing an “electric super sonic plane” one day. The nascent technology for an electronic airplane is still relatively unknown but perhaps Musk will change that in the not too distant future. Musk: I don’t think I’ll go outside of the three areas. There’s a [inaudible] on the sustainable energy front. I have an idea for an electric plane and really one that you can go suspersonic in. And then it would be interesting to take a look at fusion. That’s a really tough problem. Zachary: So that should keep you busy for awhile. Arrington: I want hear more about the electric plane that you brought up really early on in the talk and how realistic that is from a technology standpoint and from a new startup standpoint possibly. Is it possibe technically to do that in an interesting way. Seems like a lot of batteries. 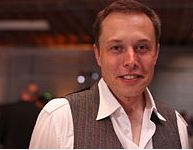 Musk: It’s a lot of batteries.Technically an electric plane gets more feasible as battery energy improves. It’s definitely feasible right now. Its just a questions of the range . . . You have to have energy density for a global plane. Basically, the electrocarrier as it functions for a plane has to be very high and then ultimately, it’s how you really use the fact that you have an electric motor driving the plane as opposed to a jet engine which is taking [inaudible]. You have to design a plane differently to deal with . . . its an interesting configuration of what you can do with vertical takeoff and landing angles with the design. It’s a tricky problem. I try not to think about because I have too much to think about.